My daughter Elaine & her husband Bryan have been married for 5 years yesterday April 14th!! They just welcomed their third child into this world several months ago, and so it's been a very busy 5 crazy years for them!! I googled 5th anniversary colors like the weirdo I am, and silver & pink were a couple of the suggested colors. I made this anniversary card for them,using the color of the bridesmaid dresses/wedding theme color which happened to be pink & silver! 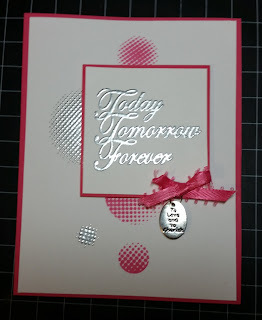 I placed the Altenew Halftone Circles stamps in a pattern consistent with the Altenew Sketch Challenge using my Misti. First I inked the pink ones & stamped them with Momento Rose Bud ink. Then I stamped the other two circles with Versamark ink & heat embossed them using a silver embossing powder. 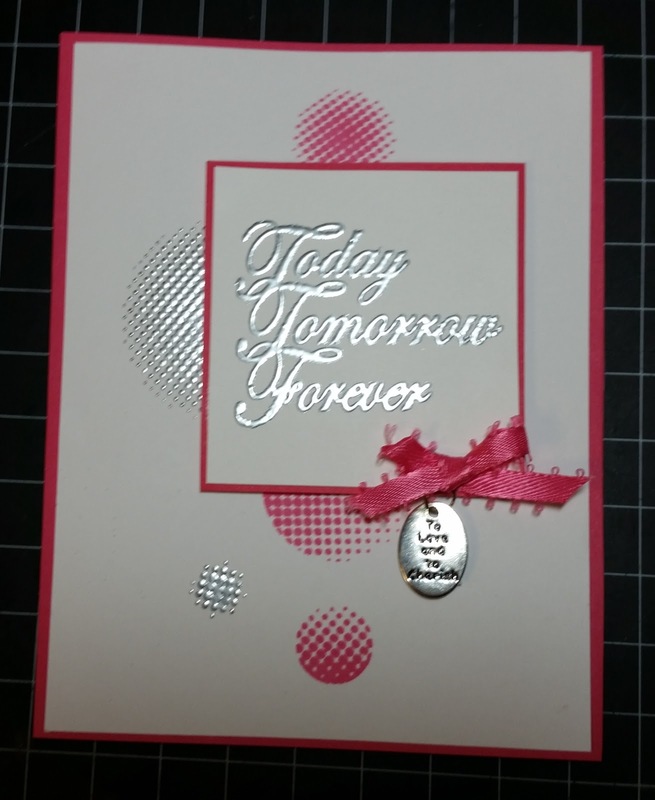 I stamped the sentiment with Versamark & also heat embossed that with the same silver powder. The pink bow that the charm is attached to is from my stash. The charm says To Love and to Cherish. I was digging deep into my stash for some sort of embellishment & found it in the bottom of the box. I know I saved it from a past family wedding favor, and thought it fit perfectly on this card! Thanks so much for stopping by to take a peek!! What a wonderful card, and a wonderful story to go along with it. Great take on the inspiration. Thanks so much for playing with us at Time Out! I love the gorgeous silver embossing. Beautiful card!